It is with great joy that I am presenting the fifth edition of the MaiTai Collection in action series. 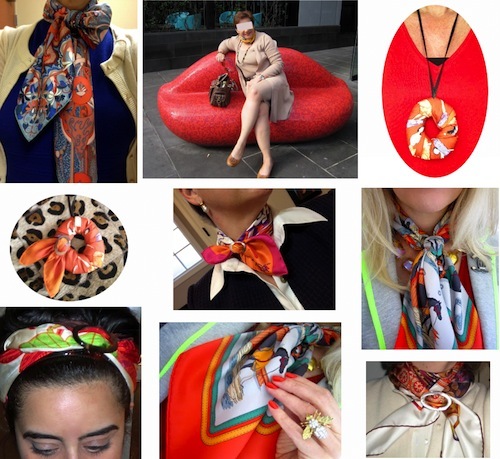 It is always a special treat to see how women from around the world wear their Hermès scarves and items from the MaiTai Collection. 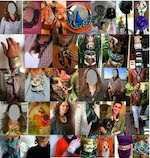 Thank you so much for sending me your beautiful and inspiring pictures dear Angelique, Anna, Bliss, Catherine, Faux Fuchsia, fritillaryB, Gina, hair-mess, Joanne, Johanna, Laura in Georgia, lazuli, Lourdes, Marla in the OC, Marla's DM, NiniNotes and Scarf Addict. 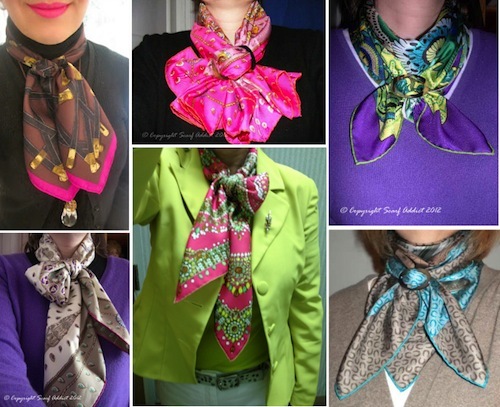 left column: top FauxFuchsia with Très Kelly and moyenne scarf ring in a criss-cross knot, below Scarf Addict with Trésors Retrouvés and a grande scarf ring in a criss-cross bow knot. 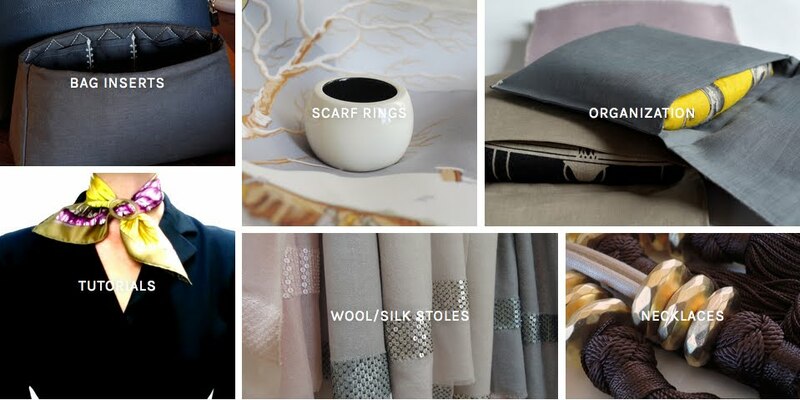 Top row: lazuli with horn shawl ring and a Kelly en Caleche CSGM in a cowboy knot, Macs with Bouclerie d'Attelage 70 Carré in a pleated bow knot, secured with a moyenne horn scarf ring. lazuli with a waterfall necklace in raisin. For anyone who would like to participate in collage #6, please email your photo to maitaicollection@orange.fr, along with info on how you would like to be credited. Looking forward to hopefully many contributions! You are so sweet, my dear Macs! My favorites are the sparkling holiday pics of you, so much joie de vivre! Mille merci again. 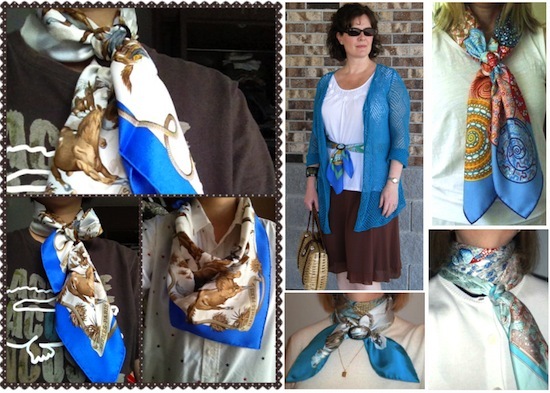 I love seeing how other women around the world wear their scarves and MT Collection items. 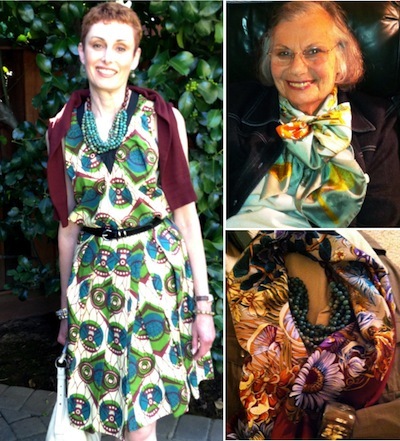 Thank you for including me, and my Mom, in this very stylish and creative silk sisterhood! Have a great week ahead. Me gusta esta entrada. Muchas ideas buenas para ponerme los pañuelos que me encantan. Thanks to google translate I could read your kind comment. Muchas gracias! Just beautiful, MaiTai. You do such a wonderful job on these collages. 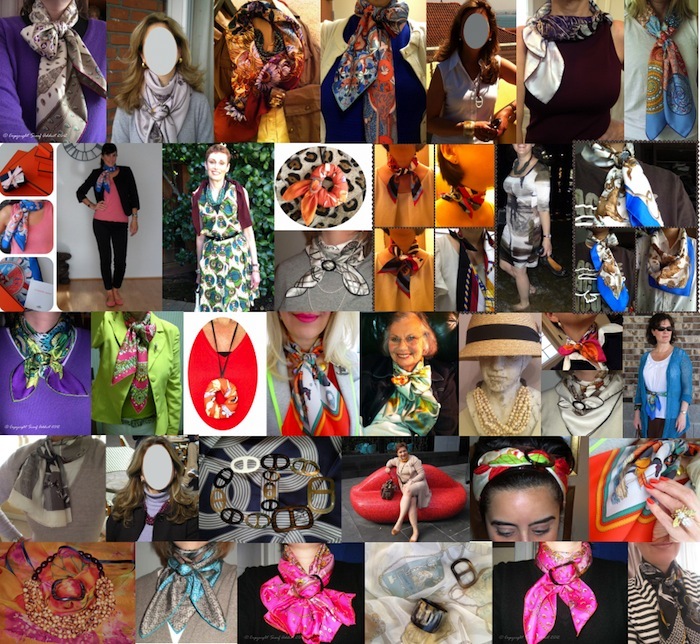 It is exciting seeing so many gorgeous scarves (and the wearers)...and seeing them worn in various ways with your lovely products. I am really dreaming of a waterfall necklace now. Merci! Silly me...I forgot to update you about my blog change. Stepping My Way to Bliss was retired and a new one started. But no worries, if anyone travels to Stepping there is a link that will take them to Vintage French Chic. The biggest change? I am no longer Bliss : ). Many thanks for letting me know about the change, and congrats on the new blog! I've changed the credits accordingly. Merci again for participating! Thanks for sharing! I want to try the pleated criss cross knot by scarf addict... How pretty! Hope it's in your library! EVERYONE-HAVE A GREAT DAY!!! Here is the link to the tutorial, dear Gina Pleated bow knot how-to (only secure in a criss-cross knot instead). Thanks so much again for participating! Flattered to be included in this montage. Love the MoP grande scarf ring more and more every time I use it. The different finishes on either side are just perfect. C'est moi! Receiving your picture was such joy, many thanks again. Dear MaiTai, I so enjoy your collages, always so artfully produced! 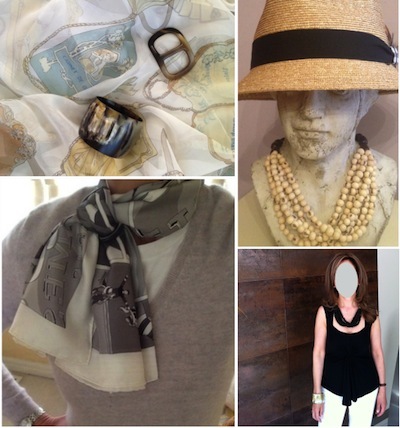 So fun to see your beautiful items in action on your creative readers, and to be included. Thanks to all who contributed! Loved your contributions, dear NiniNotes. Thanks so much again! You, ladies, look beautiful. Can I ask Marla in the OC about her dress - which brand is it? The dress is truly amazing (along with the necklace) and I cannot recall who created it...sorry the ignorance and TIA. Lea-- Thank you for your compliment. As Faux Fuschia would say: I luff it 11/10! The dress is actually two pieces and is Marni for H & M. Gotta love "cheap chic." It is actually very well made! I thought about camping out at my local H & M to get it (my DH is so sweet he even offered to camp out and hold my place in line) but decided we're too old for that! Ebay to the rescue! Gina, I love your bold and summery choice of pairing the lime green jacket and top with the bright pink PdM! And Iazuli, I have such hair envy. My hair will never behave as beautifully as yours. Yes, they are! I always study the scarf colors, how they are paired, and of course, tied. I am always in awe! And I also love Macs' and Marla in the O.C. 's dresses. You have some very stylish readers, dear. Thank uou for your very kind words, dear CS. You're very welcome, dear Manuela. Maitai!!!!! Thank you for including me. 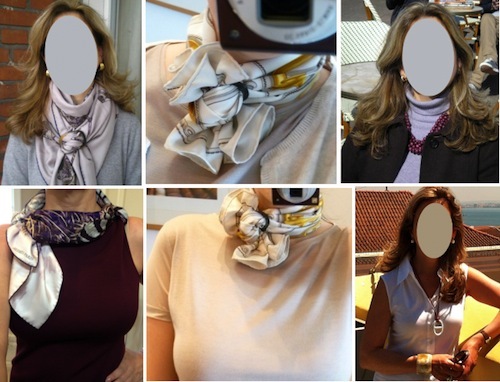 I love seeing how everyone wears their scarves and I really need to figure to how to do more ties! 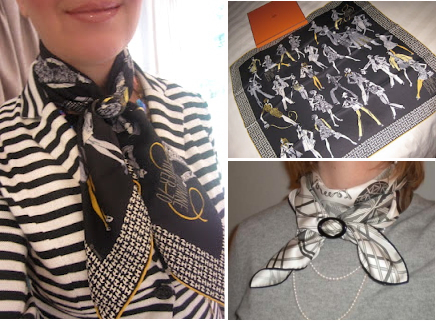 I didn't even own a Hermes scarf before I started reading your blog, and now I luff them. And it's beautiful to see how they arrange all differently their acquisitions with your good advices. Bravo it's a sunshine of beauty.